I've been getting into some very hands-on, fun projects with the books I've been receiving lately from Library Thing's Early Reviewer Program. First I tried the adult coloring book trend, and now I've become a hair stylist. 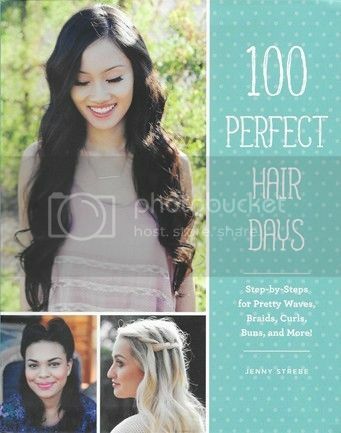 Seriously, in order to properly test drive 100 Perfect Hair Days by Jenny Strebe, published by Chronicle Books, I wanted to use the book as it was intended: to style hair. 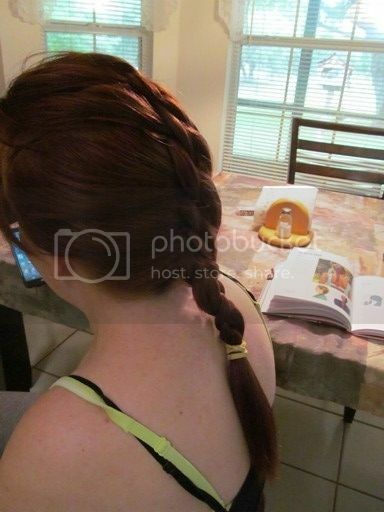 It's a bit easier for me to do someone else's hair, and much easier to photograph my efforts, too. This is why I asked my daughter's best friend, Michelle, to be my model. 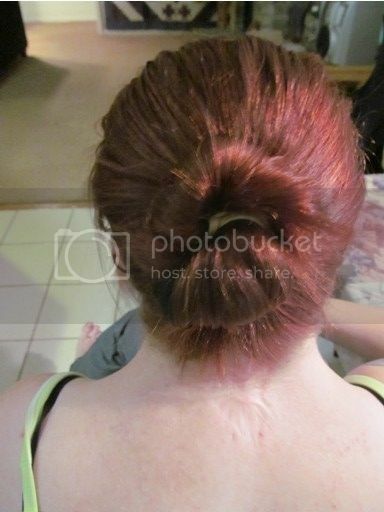 Chelle has amazing, lovely long red locks, and she's young and fashionable, so I thought she'd be a good test subject. First, some thoughts on the book itself: it's very well written, beautifully photographed, and offers many style variations. The models used for the styles are of a nice mix of ages, hair colors and hair types as well, including some African American, Asian and Latina ladies. I really liked that ethnic hair types were well-represented in the book, as we all know that not everyone is born a California blonde. The instructions are grouped in five chapters by style type: casual, out and about, sporty, dress up and extra special. There's also a whole chapter at the end, Problems and Solutions, to help the reader trouble-shoot, fix and maintain a healthy head of hair. 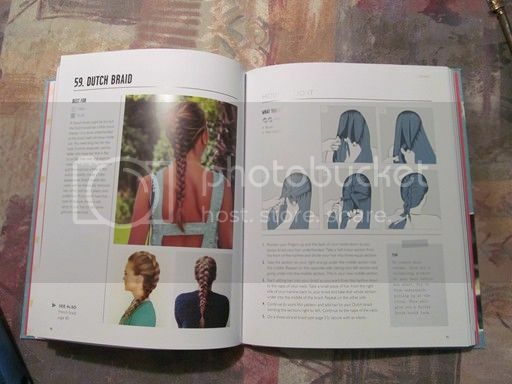 At the very front of the book are two Style 101 pages, which is a cross-indexed picture grid of the styles in the book by number, matched with the type of hair (frizzy, fine, wavy, etc.) that they best suit. That's definitely a real time-saver when you want to try out something new; you can pick a style that will work with your type of hair. As you go to each particular style, you have one page showing a model wearing it, a description of the style and some notes by the author discussing the advantages. There are also symbols of the type of hair the style suits best. 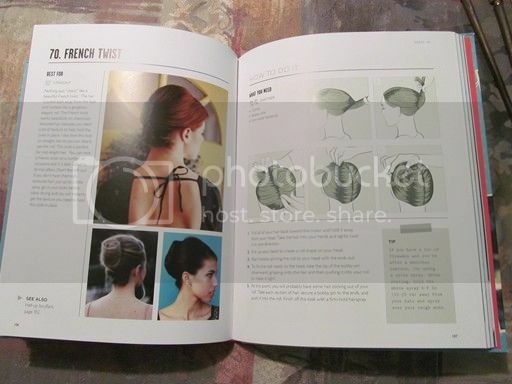 On the facing page there's a list of what you'll need to create the style, along with very clear instruction steps on how to create it, and illustrations of what your hair looks like as you go through each step. 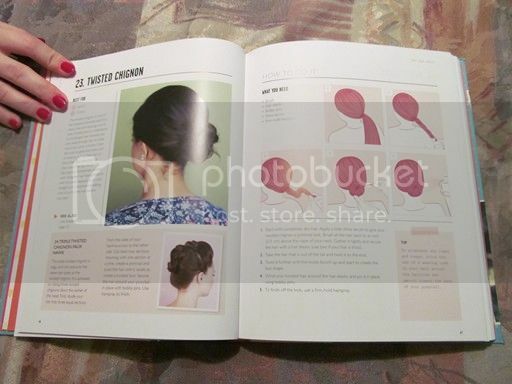 The latter is especially fabulous as a how-to reference, because you can check your hair against the illustrations as you go through the steps. Chelle's hair has long layers, which made it a bit of a challenge. I didn't get this one perfectly smooth, but she was happy with the results. This was easy enough for Chelle to do it herself, and she thought it would be a pretty style to wear when she does her volunteer work at one of our local children's hospitals. Of the three we tried I liked this style the most; I thought it turned out the best, and it could be worn for anything from a business meeting to a nice date. 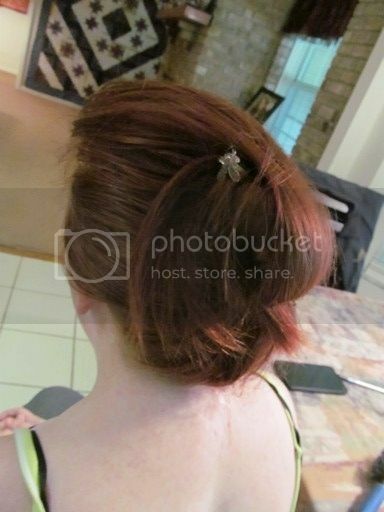 Clip a pretty barrette or a silk flower in the center of the twist and you can dress it up even more. I can't find fault with anything in Jenny Strebe's 100 Perfect Hair Days, although I did make some observations. There are no older/gray-haired ladies in this book, and I would have liked to see some because I'm one. That said, I realize that my segment of the hair styling population generally wear their hair short or go to the salon to have it styled, so it's probably sensible to stick with younger models. Also, most of the styles are for shoulder-length or longer hair, but you can't really do much with short hair, so that's also only logical. I highly recommend this book to anyone who would like to try some new styles, learn how to better care for their hair, and create more perfect hair days in their life.